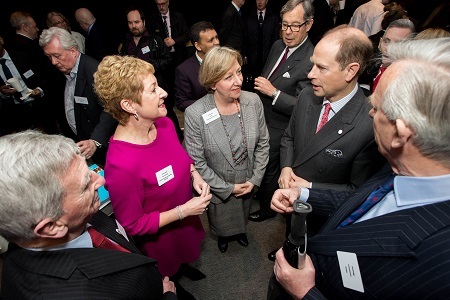 Cheshire and Warrington set out its ambitious plan for inclusive growth at an event to mark Commonwealth Day (Chester Racecourse, Monday 12 March), attended by hundreds of local businesses and held in the presence of HRH the Duke of Wessex KG GCVO. ‘The Prospectus for Inclusive Growth’, sets out a shared ambition for an even more successful and prosperous Cheshire and Warrington, improving the lives and opportunities for the people who live and work here. The ambitions include grow the regional economy to at least £50 billion (per annum of gross value added), be 20 per cent more productive per resident than the UK average, create 120,000 jobs and build 127,000 new homes by 2040. The Prospectus calls on the Government to work in partnership with Cheshire West and Chester Council, Cheshire East Council, Warrington Borough Council and the Cheshire and Warrington LEP to put in place the conditions for growth that will turbo charge the most successful economy in the North. The local economy, which already has the 2nd highest GVA per capita outside of London, continues to outperform as one of the UK’s most powerful growth engines but, if everyone is to share in that success, the sub-region needs to partner with the Government to put in place the infrastructure that will realise the potential. This means working with our region to tackle the skills shortages faced by local businesses, supporting the delivery of a more resilient transport system with better connectivity, and direct support to help build the kind of homes Cheshire and Warrington needs to house the workforce of the future. Building on the key components of the Cheshire and Warrington Strategic Economic Plan, and the ambitious work programme already underway, the Prospectus sets out how the region will deliver on the opportunities and ensure the full potential is realised. To achieve this, the sub-region is calling on the Government to be an active partner in delivery. Councillor Samantha Dixon, Leader of Cheshire West and Chester Council and Chair of the Sub-Regional Leaders Board said: “Despite significant prosperity, there are pockets of persistent deprivation, with some stark disparities in health inequality and life expectancy. If the region is to realise its full potential, we need to address those issues immediately and ensure everyone benefits from the success that lies ahead”. With the arrival of HS2, the potential of Warrington New City and the unique cross-border opportunities within the Mersey Dee Economic Access and Growth Track 360, this is a once-in-a-generation opportunity to deliver inclusive growth for the benefit of all.